But Cyr proved in one night that he could outlift them all. The only dark horse was August Johnson, a man who was very quiet. In actual contests, and by his feats, he was more entitled to call himself the champion of the world than Sampson or Sandow, but he never did. His modesty was superior to that. He actually was the only man to place down a wager with the honest intention of lifting against the great Canadian, and their contest which later took place in Chicago was the greatest in history, as I will relate in its proper place. Dinnie was an exceedingly strong man and carved a career for himself that has never been equaled for all-round ability. He was one those Scotchmen who are proud of the heather, and he had a great opinion of himself. He believed that no man was as good as a Scotchman, and he was the king of Scotch strong men. In his swinging kilt he was truly a magnificent sight. The type of Scotchman you read about but rarely ever see. I remember meeting him when he was well up in his seventies, and he was then a fine specimen of manhood, hale and hearty. 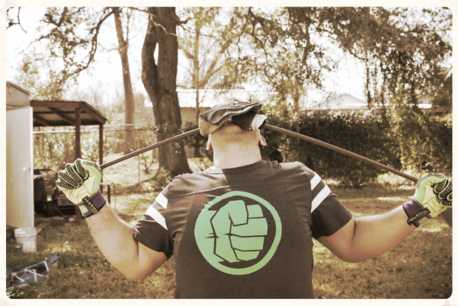 In those days he was living his glorious youth, just as Cyr was, and in throwing the hammer, putting the shot, jumping, tossing the caber, he had them all stopped. 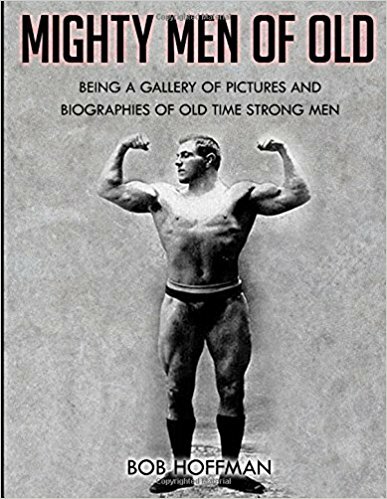 Apart from this he was a superb wrestler and had out-lifted most of the strong men that ever dared pit their strength against him. 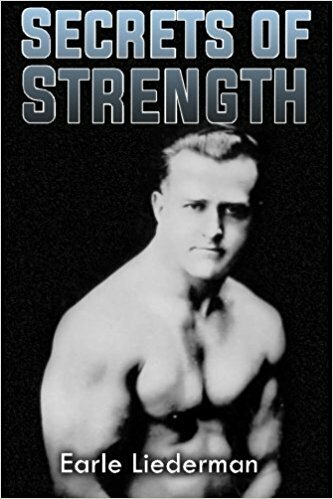 He was very powerful in lifting weights off the ground, and also in "muscling out" feats which you will recognize that Cyr was most capable of doing. Proof of his great man power is evidenced by his ability to carry a huge stone with a ring in it that some of the world's strongest men could scarcely move off the ground. How much it weighed, I am sorry to say I do not know. Somehow this cynical Scot found himself drawn to the great Canadian, and the formal meeting between Kelt and Gaul was a study in character. Dinnie invited Cyr to his home, and he afterwards admitted that Cyr was the only man that ever impressed him at first sight. Immediately the canny Scot showed Louis the great stone, and characteristically exclaimed, "I gae nae man credit wi' being stronger than I, 'less he can do what I can't." 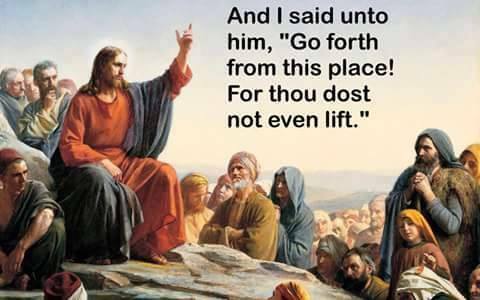 Substantiating his words, he raised the stone and walked with it. Louis did not wait for any invitation, but, fully dressed, he raised the stone and carried it like a sack of salt. Dinnie exclaimed aloud as he saw the case with which Cyr walked away three times the distance he had gone with the stone. "Mon, mon, ye should hae bane a Scot," to which Louis naively replied with a slight bow, "M'sier, I am thankful to be a French Canadian." A great friendship grew up between these two men of opposite natures that never wavered throughout their lives. Dinnie always said that Cyr had the greatest bodily strength of any man he had ever seen. Donald had toured around the world and seen 'em all; besides, had he not taken part in over a thousand contests! By reason of his own great conquests, he was more fitting to judge than any other man in Britain. Feted by Britain's "first gentleman" and peer of Sportsmen, the Prince of Wales, who later became King Edward VII, the visitor from New France stepped from one glory to another. His mild demeanor and kindly smile won him friends wherever he went, and every day he found the capital of the world a more entrancing place. Its great cathedrals and history of men of great French lineage breathed something of his forefathers. Born of simple faith, he was one of those rare individuals who could give any one the full benefit of a doubt, and being a truthful man, he never expected others to doubt his word. Consequently, he was shocked on being adjudged otherwise at one of his London performances. 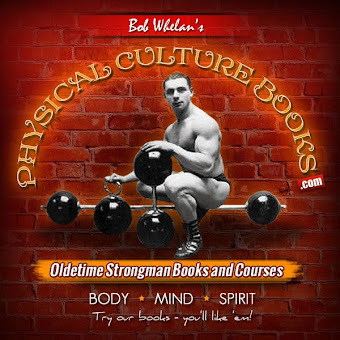 He had gone through his regular routine and come to his great dumbbell lift, in which he pushed overhead with one hand two hundred and fifty pounds at every performance. The announcer gave out the poundage and Louis pushed, but somehow it seemed to go up far too quickly for some of the gallery gods, who shouted out, "Garn, Mister, tain't no sich weight." Louis was shocked into stillness while the weight was hardly past half way up, and he stared into the audience with a surprise stamped all over his face. The fact that he now held the weight so indifferently seemed to made the lift more unbelievable, so that the chorus more mockingly repeated themselves. Speechless for the moment, Louis lowered the weight to his side and blankly stared up at his inquisitors. Then it dawned on him that these people were trying to make him out a faker. As he found his voice, he indignantly roared out his defiance, "Who are you to say that this weight is not what I say, when you have not the courage to come down and try to lift it. I will give you one hundred pounds if you can come down and lift it as I do. Please come down, as I do not want you to doubt my feat. The money is waiting for you." Thoroughly incapable of backing their words, they shut up, but all this time Louis had been standing with the dumbbell hanging at arms' length by his side; and without bending his body he gave the bell a slight arm swing that took it to the shoulder from the hanging position, and from there he pressed it overhead for the second time that night. Charles Vanstittart, the man who was known as the man with the iron hand, when recounting this incident, said that it was the greatest feat of strength he ever witnessed. Well; just imagine how great was his arm strength to slowly lower the weight and hold it by his side while keeping up a flow of talk, and them practically curl it and press it overhead for the second time, all inside of a couple of minutes. If Vanstittart had not been the one to tell it, I doubt whether I would have cared to believe it. I have spoken so much of Louis' great strength that I now must tell you of his great weakness - eating. His excuse for eating so much was that his great expenditure of strength required it. That was just his joke, though, for he was a slave to the table all his life. He could eat more that four ordinary men at one sitting, and took a keen delight in watching the amazement creep over the waiter's face when he turned in his order at the hotel. Six pounds of meat at one meal was nothing for him. He could devour that for breakfast. 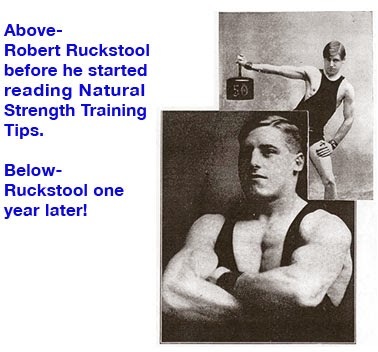 Next to a lifting contest, he loved an eating contest best, and any man who thought he could tuck more food under his belt than Louis was an agreeable friend with an agreeable pastime, and the question must be settled by a bet and a trial. Many a gourmand has gone away wiser in head and lighter in pocket after a meat-and-potato contest with the giant Louis. His homecomings were always a feast, with everything done up royally on the table. Although Louis turned out to be nomad like Hercules of old, yet he loved the land of his nativity, and in days of rest turned to his beautiful farm that was situated outside of Montreal. On it were only the best cattle, and among these was a beautiful gray horse with all characteristics of a thoroughbred. This big driving gray horse was his pride, and was a gift to him from the Marquis of Queensbury. The latter was a peer who had sprung from a long line of sportsmen, and the Marquis about whom I am speaking was a worthy son of a great father. While Louis was in England, the Marquis made the request for Louis to perform in private before him and a number of other notable British sportsmen. Gentleman Louis had not the heart to refuse, after being treated so magnificently by them all, and had all his paraphernalia sent out so he put on his entire show. Louis was magnificently received, and went through all of his stuff with gusto. He always did his best when he knew he had an appreciative audience. They marveled at his strength, and two very prominent medical men were astounded to find his flesh to be so steel-like to their touch. As they were about to adjourn to the sumptuous repast the Marquis had prepared for Louis as the guest of honor, Louis said, "But, Marquis, I need just a little more exercise to get up an appetite. 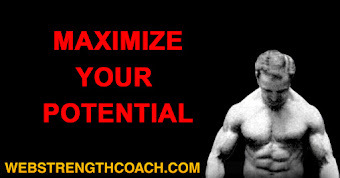 If you have a pair of horses that can pull, I will give them a chance to test my strength." Immediately they all adjourned to the stable, and the Marquis had the grooms lead out a handsome pair of driving grays that weighed about twenty-three hundred pounds. He smiled as he said to Louis, "If you succeed in holding those horses to a standstill with one hitched on either arm and each pulling in opposite directions, I will make you a present of your choice." The guests became greatly excited as they saw the huge Goliath stand between the horses, and many tried to persuade him to desist from a feat that appeared dangerously foolhardy to them, but Louis was in the throes of a physical combat which was the fire of his fiber, He threw back his head and laughed aloud in wild abandon as he felt the passion of combat surging through his blood. He gave the word, and the grays bounded away together, snorting with the discharge of all their thoroughbred power; but Louis held them as powerless as Prometheus chained to the rock. For all their herculean efforts, a mightier being held them. Louis said afterward that it was the hardest pull he had ever sustained. The Marquis and his friends were thrilled with delight, and joyfully the British peer asked Louis to make his choice before the trembling beasts were led away. After they had partaken of their repast and prepared to leave, on eof Louis' attendants led away with them the gray thoroughbred, which could be seen for many years after on Louis' farm in Canada, where it always had an affectionate, loving master. The enormity of Louis' lifts impressing the public mind; yet the average theatregoer saw no beauty in his colossal build. 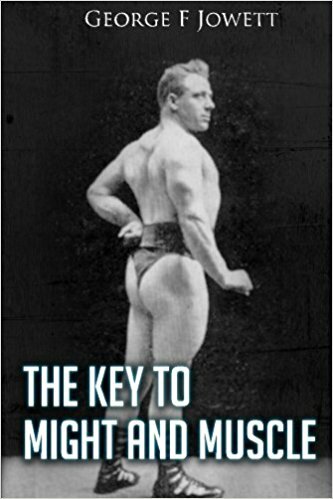 The type of physique exemplified by Eugene Sandow naturally appealed to them more. Yet who will deny that the delicate beauty of the poplar is not lost in the terrific grandeur of the mighty oak. Who would dare to compare the lovely Hudson with the roar and the roll of the giant Mississippi. You may gaze down the valleys of New Hampshire, but the majestic glory of the Grand Canyon is what will awe you with its enormity. People found in Cyr much of the primeval ruggedness which the great Northwest country breeds, and that generations of conventionality had stripped them of. His mighty frame with its immense back suggested Atlas as he must have been when he held the world upon his shoulders. Only Hercules could relieve Atlas of his load, but this earthly Atlas of the nineteenth century looked in vain for an Hercules to compare with. Sampson and his minions faded into obscurity and the light of Sandow visibly paled. Not until the Gaulish lord of Ironia bade farewell to England and Europe did Eugene regain his popularity. 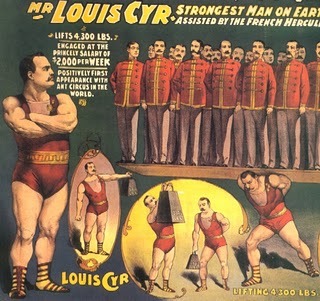 Queen Victoria received her colonial subject and showered gifts upon him until it was said that no man received such honors as the giant, Louis Cyr. France; old France; the land of his ancestors was his next destination. Gay Paris looked askance at the man whose forefathers had shaken off the dust of France from their shoes for a newer country generations ago. 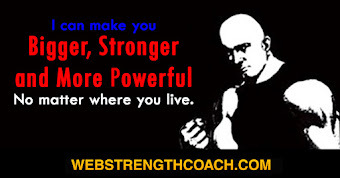 Then they had one among them who was hailed as the greatest of French strong men, and, with the typical French mind, they dubbed others as imposters in their claim to the world's strong-man title. Professor Desbonnet was one who believed the millennium of strong men had arrived with Apollon, in whom it was invested; and he did not for one moment believe the statements of Cyclops and others concerning Cyr. Even the reports from England had only made him smile, and said, "How can they judge of the strong man when they have never seen one." Truly he was justified in some of his beliefs, for those had come before Cyr in Britain were as pygmies compared to Luis Uni. But when Cyr stepped before Desbonnet stripped for action, the great professor was more appalled than any other man. So egotistical was he in his belief that anything bigger than Apollon was impossible. Desbonnet fell back as though he had been struck a blow; he reeled under the immensity of the man before him, and could only whisper, "Mon, Dieu ! What a man." The titanic proportions of Apollon fell away as he saw those mighty limbs that sprung from the trunk of a giant oak. Desbonnet in his book, "Les Rois de Force" (The Kings of Strength), names Cyr and Apollon the super-men of the ages, and says that he never saw or could believe it possible for a man to grow legs of such girth, and a chest so massive that it looked like a cliff surmounting the sea. The arms, the back, the everything. Yes; and they had the steel within them. Cyr brought the people of France to his feet and proved to them that of all strong men he was the strongest. Satisfied with his conquests, he turned his face homeward, leaving a host of friends and good fellowship behind him that has been handed down from father to son. Some years ago when I was among them, I chanced to hear some talk of the great strong men they had met, when one man rose and said loudly, " I met the greatest of them all and shook his hands. I knew the great Louis Cyr." No one denied the man. Despite their pride in meeting others, they felt that by not seeing Cyr they had lost much.